We’d love your help. Let us know what’s wrong with this preview of Substitute Bride by Noelle Adams. For more than two years, Rose has been the nanny for James Harwood's daughters. She adores the girls, but she tries to maintain a professional distance with James—no matter how attractive she finds him. However, when his engagement falls apart and he starts to look at her differently, Rose no longer sees him only as her boss. James isn't the kind of man to fall for his nan For more than two years, Rose has been the nanny for James Harwood's daughters. She adores the girls, but she tries to maintain a professional distance with James—no matter how attractive she finds him. However, when his engagement falls apart and he starts to look at her differently, Rose no longer sees him only as her boss. James isn't the kind of man to fall for his nanny, so he doesn't know why he can't stop thinking about her in very wrong ways. He's determined to resist, to keep his life simple and to find an appropriate substitute for his wife who died. To ask other readers questions about Substitute Bride, please sign up. Sweet sweet romance with likable heroine and clueless hero. Conflicts introduced through classic miscommunication.......yawn! Not a particularly memorable book, but I like Ms Noelle Adams books for their predictability and sweetness. Because sometimes whips and chains are just too much on my aging sensitive soul. Noelle Adams has quickly become a favorite of mine. Her characters are always down to earth and totally likeable, Rose and James being no different this time around. James was a single dad, his wife having died a couple of years ago. Rose was nanny to his two little girls. When the story begins, James is engaged to Genevieve although he's beginning to have second thoughts. She's always out with her friends, doesn't seem to want a relationship with his daughters, both of whom aren't fond of the w Noelle Adams has quickly become a favorite of mine. Her characters are always down to earth and totally likeable, Rose and James being no different this time around. James was a single dad, his wife having died a couple of years ago. Rose was nanny to his two little girls. When the story begins, James is engaged to Genevieve although he's beginning to have second thoughts. She's always out with her friends, doesn't seem to want a relationship with his daughters, both of whom aren't fond of the woman, and he's finding out she isn't at all as sweet and caring as his first wife. He breaks up with her but she refuses to take no for an answer. As a result, he and Rose come up with the idea of a fake engagement between them in order to convince Genevieve that she and James are really through. While Rose is determined not to get her hopes up, she's already got feelings for James and of course, she loves his girls. She'd love to make the engagement real but after her last failed relationship with a man, she's positive James couldn't possibly see her in that light. This is one of those stories you start reading and you're so engrossed you realize it's been a few hours and you're finished. This is the 2nd book and 2nd sister of the 3 Beaufort sisters. Although I liked the first book, this one was even better. Based on the beginning chapter, I thought it would be a standard outline for the plot. Instead, it took a different (and earlier) path which made it more enjoyable for me by not stretching out the drama. The hero and heroine were very likable as well a This is one of those stories you start reading and you're so engrossed you realize it's been a few hours and you're finished. This is the 2nd book and 2nd sister of the 3 Beaufort sisters. Although I liked the first book, this one was even better. Based on the beginning chapter, I thought it would be a standard outline for the plot. Instead, it took a different (and earlier) path which made it more enjoyable for me by not stretching out the drama. The hero and heroine were very likable as well as the supporting characters. It's told from both points of view so you understand their developing feelings and misunderstandings for a complicated nanny/employer situation. I liked there was a little less Grandmama this time. She's there, she's wise, she's still stiff and dower, but her role is strategically effective and entertaining. The pride makes an appearance as does one of Deanna's more interesting "suitors" from the first book, although indirectly. Overall, this book was fantastic and I'm excited for Kelly's story next. Forgot to mark this as read. It was a while ago so I can't remember it enough to review it, just marking it for my records. I commend the author for writing a cliche regency plot as a contemporary! Rosie is a Nanny. She loves the two young girls in her care. A fun game of dress up reveals she may love their father too! Rosie always dreamed of working with children and when family obligation required her get a job instead of attend college she found a Nanny job that allowed her to do both. I loved to see her care and concern with the girls. James is a widower who thinks remarrying is the best thing for his girls. I think he allowed too many people to have to much influence on his life and it Rosie is a Nanny. She loves the two young girls in her care. A fun game of dress up reveals she may love their father too! Rosie always dreamed of working with children and when family obligation required her get a job instead of attend college she found a Nanny job that allowed her to do both. I loved to see her care and concern with the girls. James is a widower who thinks remarrying is the best thing for his girls. I think he allowed too many people to have to much influence on his life and it didn't meld well with his successful businessman career for me. I liked these two characters as a couple, just not the circumstances that brought them together. I would have enjoyed more of a slow fighting it build up. Their quick move to a relationship felt more like lust to me. The characters outside this small family drove me crazy. Genevieve and James mother-in-law angered me every time on the page. Rosie's eccentric grandmother has also started to get on my nerves. However I truly enjoy Noelle Adams writing style. It is a relaxing read. Rosie's sister Kelly the keeper of the estate and the one who generally cares for crazy grandma must be next and I can't wait to see her have an HEA because I think she deserves one - if not a vacation - real soon. This is another brilliant book from the author. Rose is a very loving nanny who very much adores the two little girls that she has been looking after for the last two years, and always does more than required in her job. However she has always know that the woman that her employer is to marry is not the right woman for either him or the kids. James is a man looking for a woman to replace the whole where his dead wife was in both his and his girls lives, however he now regrets his current choice. These is a specific moment in this book on which both party realise that actually they have feelings for the other and they both try to ignore it. Of course it doesn't work. We get to see a little more of Deanna from book one, along with Kelly and Grandmama. Grandmama of course 'helps' along with the match between Rose and James and my heart just melted with the way the two little girls Jill and Julie were portrayed. I really loved them. We also get to see a tiny little bit of Kelly and who we assume will be the man for her Peter Blake, another wealthy man from a good respectable family. Rose Beaufort works as nanny to the Harwoods and cannot help but feel attracted to her boss, James. After a scheme which makes her pretend to be his fiancé, they start to fall in love with each other but there's the problem of James' ex that doesn`t take no for an answer, along with Rose's own insecurities in the relationship department. I quite liked this one by Adams as well, but it is very similar to Hired Bride, the first one in the series. In both of them, the main impediment for the couple Rose Beaufort works as nanny to the Harwoods and cannot help but feel attracted to her boss, James. After a scheme which makes her pretend to be his fiancé, they start to fall in love with each other but there's the problem of James' ex that doesn`t take no for an answer, along with Rose's own insecurities in the relationship department. I quite liked this one by Adams as well, but it is very similar to Hired Bride, the first one in the series. In both of them, the main impediment for the couple being together is lack of communication. This is a used, well used plot device that I'm getting tired of reading. But I did love James`s daughters, though. Each had a clear personality and read like real kids, differently from a lot of books that I've seen that contained children. I liked this one, I find it very cute, the little girls added some more cuteness in the whole book. It was a romance novella, not cheesy and went with the theme. Fake/rich (not the billionaire stuff)/kind/scheming. I enjoyed the introduction of Rose and her living condition and her job as a nanny. And then the situation, the drama in the plot. It was a nice development with a bit of steamy scenes (2 and 2 halves). Now let wait for the last one, the youngest. I really find her far too young to be I liked this one, I find it very cute, the little girls added some more cuteness in the whole book. Great #2 story of the Beaufort Bride series, Think I liked this one better than the first one. Grandmother is still co-ordinating her granddaughters lives with great success. If you enjoyed book 1 Then you must read this book. Looking forward to reading Kelly's story. This was my favourite of the series. I think I’m a bit of a sucker for the hired nanny falling for the widowed father plot. Yet again, another simple story and I'm kind of frustrated. The books I've read previously by Noelle had a lot more emotion and we got to see the romance between the couple... this one didn't have that. Wasn't a fan of the premise, tbh. Nicely written but there wasn't a lot for me here. I was absolutely excited to now enjoy the second amazing book from the, Beaufort Brides series. I thoroughly enjoyed the first book, and now I'm am just so keen to read this one too!! Rose Beaufort was now just so tired. Working as a Nanny was definitely hard work. She had been kept up a lot lately. The young girl named Jill, who she was caring for hadn't been sleeping well. She worked for the father, James Harwood. Rose would always worry about Jill. She was so young compared to her sister, Julie who always seemed so happier and brighter. She was sad about those bad dreams she had about that awful Stepmother. Rose was scare that she might be scared of her Father's fiancé. The girls Dad was also there at the house a lot. He worked his own business there. Rose had always thought their father, her boss was handsome. After losing his wife years before. He was to get married soon. So both he and the children seem a bit nervous about all the changes. And obviously Rose couldn't understand why he would be married to her either. She felt sad for his children too. The whole family just seemed to be stressed out. I simply adored this wonderful romantic tale. I loved all this wonderful characters. Such a marvellous book. I really loved it. I can't wait for book 3 now. I really enjoyed the book and will be getting the next book in the series right away. Can’t wait to read! It was a cute short read but a bit predictable. But a fun read none the less. Fell in love with the series. I am a huge fan of Noelle Adams! Her stories are wonderful. The Beaufort Brides series had been great! Going to start book 3 later. This was another quick and easy read. I read the first book in the series the day before and felt like I just had to read this... Over all this book was a nice guilty pleasure kinda read. I like the main character Rose and the premise, nanny-to-lover, wasn't all that bad but I definitely enjoyed the first novel more (probably just for premise reasons more then anything else). This review has been hidden because it contains spoilers. To view it, click here. Bagaimana kalau seorang nanny jatuh cinta kepada boss nya? Itulah yg dialami Rose Beaufort, anak tengah dr Beaufort bersaudari. Sarah sudah 2 tahun bekerja sbg nanny mengurus 2 putri cilik James Harwood. cerita diawali oleh ketidaknyamanan anak2 James, Julie dan Jill mengenai calon ibu tiri mereka, Genevieve. Selain itu, James mengalami sakit di rahangnya dan rada kecewa dgn sikap Genevieve yg tidak peka dan cenderung egois, mementingkan hangout dgn teman2nya. Mungkin krn itu, James mulai memperh Bagaimana kalau seorang nanny jatuh cinta kepada boss nya? Selain itu, James mengalami sakit di rahangnya dan rada kecewa dgn sikap Genevieve yg tidak peka dan cenderung egois, mementingkan hangout dgn teman2nya. Mungkin krn itu, James mulai memperhatikan Rosie, nama panggilan James kpd Rose, dan mulai muncul titik keraguan hubungannya dgn Genevieve. Di pihak Rose, dia tahu diri bhw dirinya hanyalah nanny dan berharap James lbh bijak dlm memilih calon ibu bagi putri2nya. Saat James akan menjemput anak2nya di rumah nenek Beaufort yg antik, Rose dan putri2 James sedang asik bermain seolah2 mereka ada di Ball dan Rose dipaksa mengenakan baju pengantin milik Georgina Beaufort, nenek moyangnya yg sewaktu mengenakan gaun ini sedang hamil. Tak dinyana James terpana melihat kecantikan dan lekuk2 tubuh Rose dlm balutan gaun pengantin ini. James juga ikut dipaksa mengenakan pakaian zaman dulu dan berdansa dgn Rose diiringi sorak dan tawa Julie dan Jill. Sayang kebahagiaan mrk dirusak tiba2 oleh kedatangan Genevieve, yg tiba2 cemburu buta dan bersikap kasar kepada putri2 James. James akhirnya dgn tegas memutuskan pertunangan mereka, namun Genevieve tidak terima diputuskan sepihak. Di depan umum, Genevieve tetap mengumumkan pertunangan akan dilanjutkan ke pernikahan, sampai3 ex mertua James (ortu mendiang istrinya) yg menjodoh2kan dgn Genevieve, sampai termakan rumor tersebut. Akhirnya James berkonspirasi dgn Rose untuk berpura2 bertunangan (padahal diam2 mereka sudah saling menyukai) dan merencanakan akan mengakhiri pertunangan palsu ini diam2 setelah Genevieve menyerah utk tetap mendapatkan James. Namun gara2 kbnykan minum, keduanya akhirnya malah tidur bersama. Besok paginya, baik James dan Rose bersikap seolah2 tidak terjadi apapun, masing2 pihak takut tidak terbalas cinta mereka satu sama lain. Dan semakin James melihat Rose, dia semakin cinta akan kebaikan dan ketulusan Rose terhadap dirinya dan anak2nya. Rose berupaya utk menghindari James, namun malam itu dia ingat telah meninggalkan bra nya di kamar James dan blm sempat diambil dan berencana mengambilnya. Rose tidak menyangka James sudah pulang dan tidur disana. Rose terpentok dan malah jatuh ke tempat tidur James (yg memang blm tidur nyenyak) dan selanjutnya mereka kembali.... eheemm... bercinta. Sayang tiba2 ada gangguan telepon dari Genevieve yg histeris bhw tunangan pelariannya melakukan tindak kekerasan terhadap dirinya. James yg sudah kenyang dgn ulah Genevieve, tidak serta merta percaya dgn ceritanya. Namun bagi Rose, ini adalah pertanda bhw dia harus mengakhiri hubungannya dgn James dan resign juga sbg nanny. Dapatkah James merebut dan meyakinkan Rose kembali? Baca sendiri kelanjutannya. Widowed father and nanny romance with two adorable little girls and a HEA! Substitute Bride takes on the theme of a nanny and a widowed father, with elements of a fake romance thrown in, that soon turns into a very real romance that neither one could have foreseen until events force their hands. This relatively short romance between two very likeable and sweet characters, who you can’t help but hope will get a HEA, is guaranteed to leave you feeling happy, despite all the drama that takes place, Widowed father and nanny romance with two adorable little girls and a HEA! Substitute Bride takes on the theme of a nanny and a widowed father, with elements of a fake romance thrown in, that soon turns into a very real romance that neither one could have foreseen until events force their hands. This relatively short romance between two very likeable and sweet characters, who you can’t help but hope will get a HEA, is guaranteed to leave you feeling happy, despite all the drama that takes place, and is the perfect book to pass a few hours with. Rose, who is nanny to James’s two adorable daughters Jill and Julie, is a quietly confident woman who has been hurt before and is relatively happy with her life the way it is ticking by. James, a widowed father, believes he needs a wife for his daughters, one with similar traits as his deceased wife. The chemistry between Rose and James isn’t necessarily instantly obvious, instead unfolding at a steady pace that quickly becomes apparent as the story progresses. Once unlocked, through the use of dual points of views, we see the sticky situations and emotions both James and Rose go through as the crossed lines start to blur together and they have to figure out how they truly feel and what they both want in life. The length of time that Rose has worked for James added to the validity of the relationship that develops between the two characters over a short period of time. 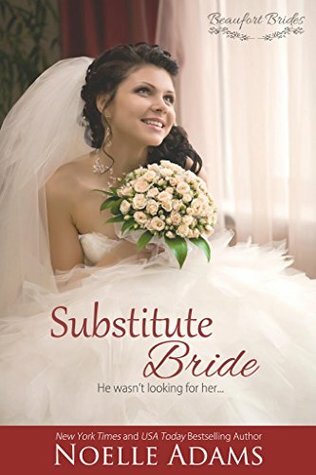 Substitute Bride is an enjoyable read that is well written and relatively easy to follow with a solid plot that moves at a fast pace. The characters of Jill and Julie were adorable and added elements of both comedy and heartfelt moments to the story as a whole, especially in showcasing the natural role and relationship Rose had with James’s daughters, something that needed to be done with a fine balance and which Noelle Adams achieves. It was also nice to see other characters from the previous book in this series pop up but be assured, you do not need to have read Hired Bride before reading this book as it can truly be read as a standalone. If you have read it, it just adds that extra dimension and familiarity with some of the characters. I loved that we got an epilogue which summed up Rose and James’s story, while also setting up the final book in this series. There was just one small thing where in a scene there was a little contradiction of words; one minute James says he will be picking up his daughters from their grandparents but goes on to say picked up from school. Not a major issue, just a small little thing. Overall, if you are looking for a relatively sweet family romance with drama and some sexual content (but doesn’t overrule the story), definitely give this book a read! James is a widower who lost his wife two years ago and now feels compelled to find a substitute wife and mother to his daughters. He doesn’t necessarily need to love her but does feel and need of compatibility with the most important aspect being to being a Mother to his girls, Jill and Julie. He believed he found that in Genevieve, a friend of his late wife’s and his in-laws. Rose is a nanny to Jill and Julie and she absolutely adores them and secretly she is also very fond of James. Rose is aw James is a widower who lost his wife two years ago and now feels compelled to find a substitute wife and mother to his daughters. He doesn’t necessarily need to love her but does feel and need of compatibility with the most important aspect being to being a Mother to his girls, Jill and Julie. He believed he found that in Genevieve, a friend of his late wife’s and his in-laws. Rose is a nanny to Jill and Julie and she absolutely adores them and secretly she is also very fond of James. Rose is aware of the fear the children have for their future Step-Mother, and also the fact that James is more stressed than he should be, but what is she to do when she is the hired help? She does what she can and that is to take of the girls and love them as she already does. Unaware to Rose, James is starting to realize the depth of her love of his daughters and seeing her in a far different light than the hired nanny. When Genevieve shows her true colors to James, he calls off their engagement. Genevieve isn’t too happy about that and threatens James with his own regret for breaking up with her. James doesn’t believe she can really do anything about the situation but how wrong he is. Genevieve causes scene upon scene which in one way brings James and Rose together in a fake engagement and then tears them apart. Genevieve isn’t the only one who is manipulating the situation. Rose’s own grandmother, who with a penchant for the family’s ancestral history and an uncanny habit of making odd comments of prediction, will set into motion James and Rose making their decision to be with each other….or not. With Rose dealing with past relationship baggage and James working through his own fears it doesn’t look promising for the couple. But wait until those darling daughters take things into their own hands and express their opinions to James. It will be up to James to decide if he wants to be with Rose and complete their family or let her go for good. I love Noelle Adams books. She never fails in her delivery of a wonderful romantic tale. There is always a bit of drama that leads to love and happy endings. I also loved this added bonus of the grandmother in this series. Her character is a stalwart member of the old society with her opinions of what is proper and what isn’t. She isn’t one to show her emotions on her sleeve but her actions relay them loudly. All of Ms. Adams characters are created as realistic personas with very real like situations the reader can get caught up in. Her stories are easy and flow with ease so that they are enjoyable. You know what I liked about this book? It didn't trash the dead wife. I can see where that would be the easiest way to write a romance story, where the widower either knows or comes to realize that the wife that passed away wasn't as great as everyone remembers her to be. Sure, that scenario happens in real life, but it also happens that she's wonderful and he has to go on and he finds someone else to love differently -- how often do you see THAT plotline? I was glad to see it here! Melissa was a You know what I liked about this book? It didn't trash the dead wife. I can see where that would be the easiest way to write a romance story, where the widower either knows or comes to realize that the wife that passed away wasn't as great as everyone remembers her to be. Sure, that scenario happens in real life, but it also happens that she's wonderful and he has to go on and he finds someone else to love differently -- how often do you see THAT plotline? "...Melissa could never be replaced. Rose was completely different. But he could love her just as much." EXACTLY! This book was like a contemporary spin of the rich-widower-falls-for-nanny books of yesteryear. Except in this contemporary version the hero isn't a brooding jerkbag - man I hated those rich, broody, alpha damaged JERK heroes. (Hmm. Except for the jerk part, this kind of describes Batman -- but without the kids of course.) And the heroines that were ascribed as "feisty" but were really TSTL and a bit witchy. I am a big Noelle Adams fan, so whenever she has a new book available, I add it to my TBR list. Her stories always keep me happy, entertained and interested. Substitute Bride is a welcome addition to her Beaufort Brides series and I enjoyed it very much. I love stories about weddings and Ms. Adams always tackles the subject with lots of creativity. A kind and loving nanny can most certainly help a family that lacks maternal support. In this story, Rose Beaufort is the nanny to two very cute littl I am a big Noelle Adams fan, so whenever she has a new book available, I add it to my TBR list. Her stories always keep me happy, entertained and interested. Substitute Bride is a welcome addition to her Beaufort Brides series and I enjoyed it very much. I love stories about weddings and Ms. Adams always tackles the subject with lots of creativity. A kind and loving nanny can most certainly help a family that lacks maternal support. In this story, Rose Beaufort is the nanny to two very cute little girls, and she has created an environment filled with warmth and affection. For two years she has worked for James Harwood, a wealthy widower, and truly loves her job. Most recently, Rose and James shared a dance, and all at once they begin to see each other in a romantic way. As a result, James breaks it off with his bitchy fiancee and begins to see a life with Rose as a wife and mother. Rose has been hurt before and is skeptical about finding love, plus her job is very important and she loves the girls with all her heart. She does not want to ruin what she has if a relationship with James does not work out. Ms. Adams nicely combines joy, heat, and drama into this romantic novella. I immediately connected with Rose and James, and there was never a moment that I did not want them to be together. James' girls added a cuteness factor that kept me smiling from ear to ear. Overall, a solid read. Wow....that was a whirlwind romance. I am not absolutely consumed by this book series. It is bittersweet that there is only one more. James and Rose were no different than Roses' sister, Deanna and love interest, Mitchell. When they say not to judge a book by its cover, I say don't judge this book by its title. I am again highly impressed with Noelle Adams again. I love how James' and Rose's story starts out as something innocent but changes into something beautiful. I love the continued charact Wow....that was a whirlwind romance. I am not absolutely consumed by this book series. It is bittersweet that there is only one more. James and Rose were no different than Roses' sister, Deanna and love interest, Mitchell. When they say not to judge a book by its cover, I say don't judge this book by its title. I am again highly impressed with Noelle Adams again. I love how James' and Rose's story starts out as something innocent but changes into something beautiful. I love the continued character development as each story goes along. For me, all three stories are like one complete one. You can't have sister's story without the other two. I love all the added drama in this one. So far, Rose is the girl/sister I feel most connected to. She is someone I can totally feel connected too. She's the quiet but there is something about her that makes her almost the strongest of the three sisters. She loves James' two daughters fiercely. What man wouldn't want that? Their grandmother, Mrs. Beaufort is slowly becoming a force to reckoned with. It seems to me she is the driving for behind her three granddaughters. I am really looking forward to Kelly and Peter's story. Who know what Grandma Bearfort has in store? Another sweetie of a story from Noelle Adams! In this continuation of the Beaufort Brides series, the story centers on Rose. She's a nanny for two adorable girls, Jill and Julie, who are the daughters of James. After his fiancee proves herself to be less than likable, the engagement is off. He and Rose talk, and he finds himself seeing Rose in a new light. Given the circumstances, he can't give in to that temptation no See more of my reviews on my blog Thoughts At One In The Morning. Another sweetie of a story from Noelle Adams! In this continuation of the Beaufort Brides series, the story centers on Rose. She's a nanny for two adorable girls, Jill and Julie, who are the daughters of James. After his fiancee proves herself to be less than likable, the engagement is off. He and Rose talk, and he finds himself seeing Rose in a new light. Given the circumstances, he can't give in to that temptation no matter how strong the pull is. But since his former fiancee doesn't seem to get the picture about their engagement being over, James and Rose pretend to be engaged. It doesn't take long for them to realize how much they want something fake to actually be real. Substitute Bride is quite charming! I loved watching the romance unfold between James and Rose. It was sensual and sweet at the same time. And his daughters are absolutely the cutest--I wish I could just hug them both for real. It was also great to see and hear about characters from the first book again. Noelle Adams does it again as usual. Can't wait for the next story in the series! She loves travel, art, history, and ice cream. After spending far too many yea Noelle handwrote her first romance novel in a spiral-bound notebook when she was twelve, and she hasn't stopped writing since. She has lived in eight different states and currently resides in Virginia, where she teaches English, reads any book she can get her hands on, and offers tribute to a very spoiled cocker spaniel.